Do you have two or more video clips that you’d like to merge into a single video? Whether you simply recorded several short videos on your smartphone that you’d like to join or you want to create a ‘highlight’ reel, or something else entirely – being able to combine videos will definitely open up a number of options and opportunities. Needless to say, there are a few things that you’ll need in order to combine videos: The videos themselves and a video editor that is capable of the task. 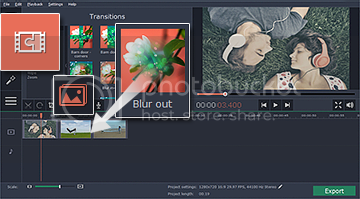 For the latter, the Movavi Video Editor should be ideal due to its simple and intuitive nature. Add the videos that you want to combine to the software by clicking ‘Add Media Files’ and selecting them. Move around the videos as they appear in the ‘Timeline’ so that they are in the sequence that you want them to be. Save the video by clicking ‘Export’ and selecting a format or choosing one of the presets to automatically optimize your video for a particular device or platform. As you can see there really is nothing to it, and once you’ve saved your video it will be combined in the sequence that you arranged. If you want you could do much more than that however, and use the other features of the Movavi Video Editor to cut and remove unwanted parts from the videos that you’re combining, insert stylish animated transitions between clips, and add background music or voiceovers. In fact, you can even use the Movavi Video Editor to improve your video by enhancing its quality, correcting common issues, and applying special effects and filters. Long story short, instead of simply combining your videos to make a single video – you could really transform it into something much more attractive. Whether you want to do so is entirely up to you however, but it doesn’t hurt to have options. Leaving all that aside, it should be clear that combining videos with the Movavi Video Editor is really as easy as it gets. With just a few simple clicks (and dragging videos around to arrange them in the ‘Timeline’) you will be able to merge as many clips as you need, in whatever sequence you require. This entry was posted in Uncategorized on April 27, 2016 by simplyjess.